Ivory roses and and a delicate yellow butterfly intertwine in this styrofoam* open heart “Love in Bloom” wreath. -Sheer metallic ivory wire-edged ribbon, 1/2″ x 1 yd. 1. Cut 4″ length from copper wire. Use pliers to bend wire into a hook. Glue one end of hook into top center back of foam wreath; secure with two floral pins. 2. Bend small loop into end of spooled wire. Continue turning pliers in direction of loop to form 2″-diameter wire spiral. Leaving 2″ straight wire tail, cut spiral from spool. Glue tail into bottom point of heart; secure with two floral pins. length to top loops of spiral at top of heart. Hang wreath by ribbon. 3. Glue clusters of light and dark moss to wreath, completely covering surface and floral pins. 4. Bend small loop into end of spooled wire. Unwind approximately three feet from spool, but do not cut until all letters are formed. Using photo as guide, bend 8″-tall script “L” into wire. Finish bottom loop by wrapping over center. Form remaining letters as shown. Leaving 2″ straight wire tail, cut word from spool. Bend small loop into wire tail. 5. Center word on heart. Secure “L” and “e” with two floral pins each. Glue small pieces of moss to wreath to hide floral pins. 6. Use wire cutters to trim rose and leaf stems. 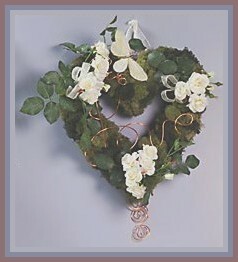 Insert stems into wreath as shown. 7. Cut six 4″ lengths from ribbon and floral wire. Use wire to wrap ends of each ribbon length together, forming loops. Glue wire ends into wreath around rose clusters. 8. Cut 18″ length from copper wire. Loosely wrap wire around fingers to create interesting shape, leaving 2″ straight tail at one end. Glue and insert straight end into top left side of heart, between roses. Glue butterfly to free wire end; let dry. Position butterfly so it appears to fly above roses. 9. Bend small loop into end of spooled wire. Continue turning pliers to form 2″-diameter wire spiral. Leaving 4″ straight wire tail, cut wire spiral from spool. Bend small loop in end of wire tail, curling in opposite direction from first spiral. Continue turning to form second spiral. Finished shape will look like a spiraled “S.” Repeat to form a second double spiral. 10. Attach one double spiral to single spiral at bottom of heart. Outer loop at top of double spiral should rest inside center of single spiral. 11. Use hook at back of heart to wire second double spiral to wreath. Wrap hook around center of double spiral so spiral is horizontal and loops show above top of heart. Wire loops should lay flat against back of heart. Glue loops to heart; secure with two floral pins.